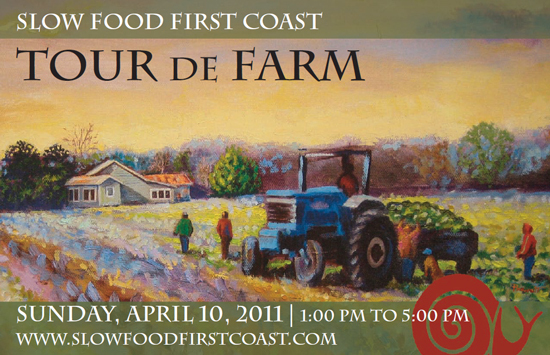 Join me this Sunday at the Slow Food First Coast Tour de Farm! Over twenty local farms in St. John’s, Baker, Bradford, Duval and Putnam Counties are opening their gates to the community for this free event. What better way to spend a sunny Sunday afternoon than to chat with farmers, pet baby pigs, watch cooking demonstrations from some of the area’s best chefs, pick produce straight from the farm, and sample artisan foods. If you’re a food-lover you definitely need to check out Slow Food First Coast. The organization is making great strides in fostering a collaborative, sustainable, pleasurable food system here in Northeast Florida. You may have seen the Snail of Approval emblems scattered about town. 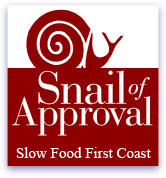 The Snail is awarded to local food businesses that espouse the ideals of the organization – read more about the Snail of Approval here and take the time to nominate local food businesses that fit the bill. I’ll be at Black Hog Farm in East Palatka from 1 to 5 on Sunday, so come and say hi! I’ll be wearing two hats. 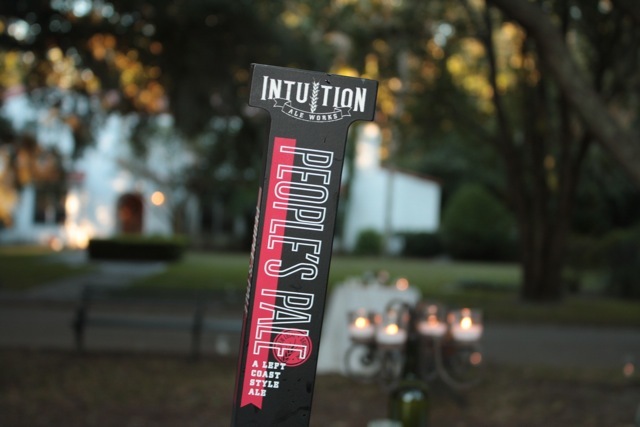 As a newly elected Board member for Slow Food First Coast, I’ll be there to represent the organization and answer any questions folks might have about the Tour. There will also be a delicious farm-fresh meal served throughout the day. It’ll be catered by Chef Sean Irwin of Chew Restaurant – can you say, yum? Grilled homemade heritage pork sausages… fresh-from-the-farm barbecued pulled pork… new potato salad… Hastings cabbage coleslaw. You know you want some. Make a reservation for the meal by calling Chew. Intuition Ale – my other hat! – will be pairing our Longleaf Amber Ale with the meal. In the words of Boss Ben the brewer, the Longleaf is an American-style amber ale with pine and citrus aromas and a smooth malt backbone. It’s brewed with chocolate, caramel and honey malts and dry-hopped with primarily Chinook hops. In the words of me, it’s freaking delicious. All proceeds from the sale of beer will go to Slow Food First Coast. Chef Brian Siebenschuh of Restaurant Orsay will also be greeting guests at Black Hog Farm. So, yeah. My favorite local food people, all in one place! As a side note, Black Hog Farm operates their Jacksonville CSA out of the brewery so I’ve gotten to know them well. One day they brought a day-old runt baby pig to the brewery because her siblings wouldn’t let her feed from mama. The Black Hog crew were feeding her out of a bottle like a human baby until she could re-join her family. They’ve also given me surplus locally-grown veggies from their CSA. They’re good folks and you really should come out and meet them! There’s lots of good stuff going on at other farms, too. Check out the Tour de Farm booklet at www.slowfoodfirstcoast.com/tourdefarm.html. It has maps and all the details you’ll need to help plan your Tour itinerary. Some of Northeast Florida’s best chefs are participating in the Tour. Chef Tom Gray from Bistro Aix will be serving a farm-fresh lunch at Twinn Bridges Farm in Macclenny. What’s on the menu? Chicken salad featuring Black Hog Farm pulled roasted chicken over farm fresh lettuce & creme fraiche dressing… chopped farm salad featuring Twinn Bridges lettuce, cucumbers, tomato, spring onion, carrots, radishes, basil and red wine vinaigrette… Bistro Aix crispy chips... and a fresh-baked Bistro Aix chocolate chip cookie. Sweet Grass Dairy will also be at Twinn Bridges offering their cheeses for sample and for sale! These are the best cheeses produced in our region. My favorites are the Asher Bleu, Lumiere, chevre and their Camembert-style Green Hill. Chef Genie Kepner of St. Augustine’s The Floridian cooking up local potatoes at Blue Sky Farm and Chef David Scalise of the Sawgrass Marriott offering cooking demonstrations at KYV Farms. Chef Scotty Schwartz from 29 South in Fernandina Beach will be at the Arlington Community Garden preparing tastings of farm-raised heritage pork from DelKat Farm served over an oyster leek ragu and drizzled with smoked paprika oil. Demonstrations are at 1:30 and 3:30pm. Chef Jean-Stephane Poinard of St. Augustine’s Bistro de Leon will be demonstrating farm-fresh salads at 1:30 and 2:30pm at Fresh Start Hydroponic Farm. There will also be datil pepper products and Minorcan clam chowder for sale at the farm! Chef David Bearl from First Coast Technical College will be making datil dogs and "slaw" and will be serving them at St. Johns Oaks Vineyard. Artisans will also be selling handcrafted locally-produced foods at various locations during the Tour de Farm. PJ from Seacow Confections will offer a free scoop of his delicious homemade sorbet at Terk’s Acres Goat Farm. 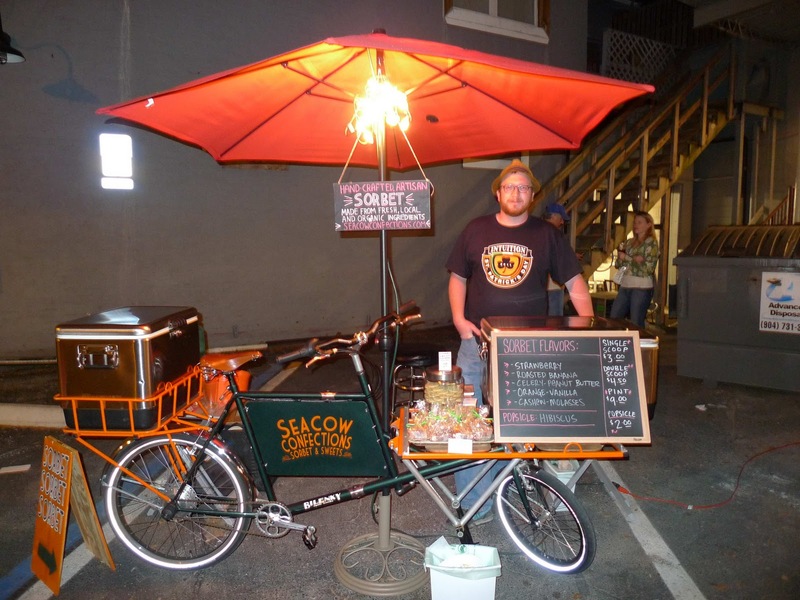 Seacow Confections parks outside Intuition Ale on Friday and Saturday nights so if you miss him on Sunday make sure to come and try his amazing sorbets, popsicles and candies at the brewery! Wow, I really need to make my way there next time I'm up in Jacksonville! Very cool!